The Ooh La La Armchair by PB Teen is a true classic. It looks like it came straight out of a fairytale. It is impeccably designed and artfully crafted and brings a Vintage Parisian quality to your decor. You won’t help but love its fine hue, unusual design, and high functionality. The Ooh La La Armchair by PB Teen is defined by beautiful moldings, elegant curves, and timeless charm. It will add a touch of period beauty to your room. The chair is crafted out of kiln-dried hardwood and boasts a strong, durable structure. Its pure cotton twill upholstery makes for a luxurious and plush seat and backrest. The armchairhas a gently curved, white silhouette that is highlighted by beautiful moldings. It brings about a tone of delicacy and modesty to spaces. Its innate feminine charm is fit to enhance your home décor. Ooh La La creates very refined and sophisticated interiors. It is not only a treat for the eyes but also something you can experience and relish. It is available in a variety of color options and patterns to suit any setting. While it is best suited to feminine rooms, you can get it in a neutral color to add masculinity. It makes a fine feature piece for any space! Clearly designed to act as a piece of accent furniture, The Ooh La La Armchair from PB Teen will steal the show with its elegant vintage form. It features user-friendly ergonomics and will elevate your comfort. 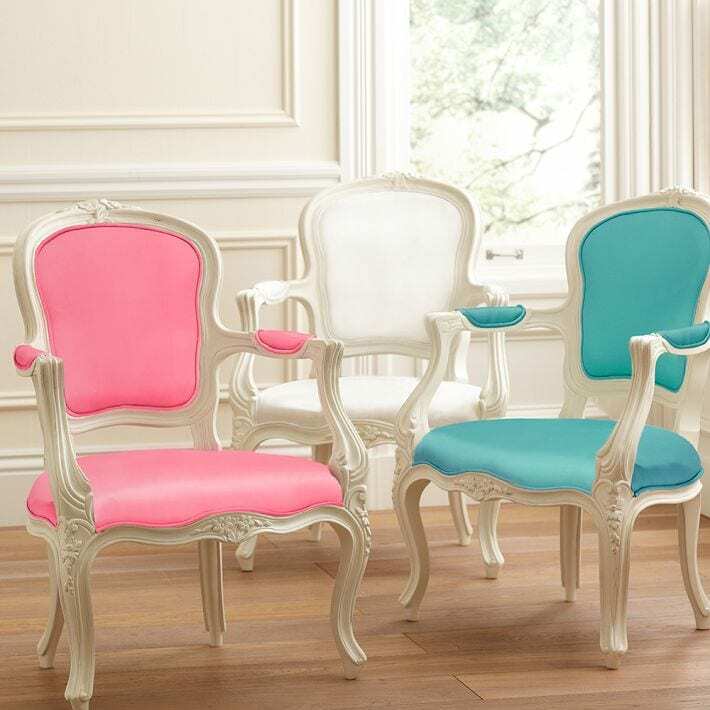 Ready to add vintage charm to your space with the Ooh La La Armchair?